Founded only five years ago, US-based stomp-box manufacturers Strymon have quickly gained a loyal following. 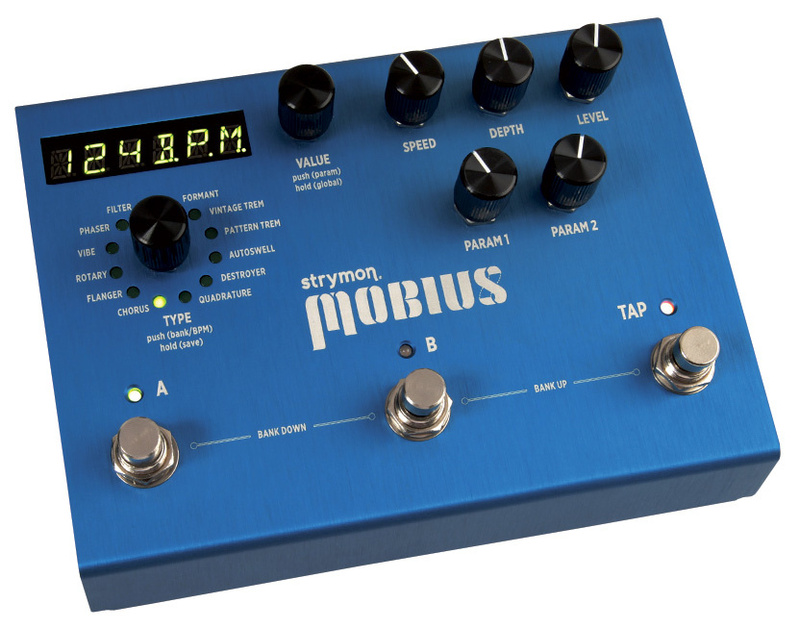 Their recently-launched Mobius aims to cover the world of modulation effects — chorus, phasing, flanging, and a good few others. 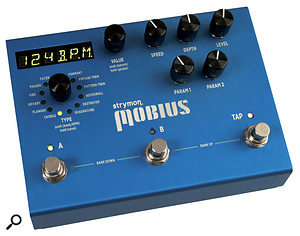 Despite the use of what is described as an 'insanely powerful' SHARC DSP chip, the Mobius is a one-sound-at-a-time machine, and the cost of entry puts it well beyond impulse-buy territory — but, on the other hand, Strymon claim that this pedal's sonic quality makes it good enough not only on stage, but also for serious recording use. So let's find out what you get for your money. Housed in an attractive and sturdy anodised-aluminium casing, the Mobius cuts a quietly professional dash, with unfussy knobs and clear, modern legending. A quartet of rear-mounted jack sockets provides the stereo analogue I/O, and there's also an expression pedal input, MIDI I/O, an input for the included 9V DC power supply, and an intriguing pre/post switch. Battery power isn't an option, and with no on/off switch, plugging and unplugging or switching at the mains is required, which isn't ideal. Three footswitches are used to select from 200 patches (100 banks with A and B variations) and for tap tempo. Seven knobs cater for parameter tweakage, and a six-character LED readout displays the patch, tempo and editing information. The switches are completely silent in operation and, although it's not huge, the LED display is clear and large enough to be useful, even from a distance. The pre/post switch allows the Mobius' processing to take place before or after other units in a mono effects chain, without the need for re-patching, and I found this very useful. Using the Mobius left input for the instrument, the left output is sent to the rest of an effects chain, returning to the Mobius via its right input and thence to an amp or recorder from the right output. Arrangements are savable on a per-patch basis, so you can have a Mobius effect before, say, a distortion pedal on one preset, and after the distortion on another — a very neat solution to an age-old problem. Additionally, both a hard-wired 'true' bypass and a high-quality buffered output are available, giving gigging musicians the choice of how best to deal with long cable runs and busy effects setups. Each Mobius patch is based on one of 12 'modulation machines', namely Chorus, Flanger, Rotary, Vibe, Phaser, Filter, Vintage Trem, Formant, Pattern Trem, Autoswell, Destroyer and Quadrature. Most are self-explanatory, but the more obscure deserve a quick explanation... Formant produces vowel-like sounds which may evoke Daft Punk or Bon Jovi's 'Livin' on a Prayer', depending on your age and musical reference points, and Pattern Trem is a programmable tremolo of up to eight beats. Autoswell is a simple but surprisingly useful 'fade-in' effect, while Destroyer provides digital distortion based on bit-depth and sample rate reduction, along with a slightly gimmicky scratched-vinyl effect. Finally, Quadrature uses FM, AM and frequency-shifting modulation to create atonal effects of varying severity. The Mobius sounds as glorious as its tech-spec suggests, with 24-bit, 96kHz converters, 32-bit floating-point processing and a 110dB signal-to-noise ratio. The rich, smooth and dynamic chorus/flanger/phaser-type effects are the stars of the show: when I compared these with effects from some classic Electro-Harmonix and MXR pedals, the Mobius more than held its own in terms of clarity, warmth, smoothness and depth, but without the usual hiss and clunky pedal switching. The carefully designed rotary, vibe and tremolo emulations are thoroughly convincing, and the Destroyer and Quadrature machines, something of a bonus on a unit of this kind, can yield some interesting and useful sounds. Many digital processors seem to place their sound 'on top' of the dry signal, but both instrument and effect emerge from the Mobius beautifully integrated; you get a chorused guitar, rather than a guitar coated with a layer of 'chorus.' This isn't just for guitars, though, as the Mobius can handle up to +8dBu input levels, which means that all manner of signals played live or sent from a DAW are ripe for treatment. Electric pianos respond spectacularly, and bass guitar is also handled well: my Fender Precision gained a beautiful shimmer, while retaining all of its grunt and bottom end. Although there are more controls than on a typical stomp box, the number of editable parameters on each patch (six or seven on average) is quite modest when compared with some studio tools. To my mind, though, a good balance has been struck, with greater than adequate flexibility on offer without intensive menu-surfing. In addition to the hardware speed, depth and ±3dB level controls, each modulation machine can be fine-tuned via a short list of editing options accessed by a push of the Value knob, and any two parameters from the menu can be assigned to the Param 1 and 2 knobs for quick access, again on a per-patch basis. The Phaser machine, for example, has seven separate algorithms based on well-known (but unidentified) models, with additional control over regeneration, waveshape, headroom, spread, tap division and pre-post switching. Knob values can be assigned to an expression pedal, allowing for foot-controlled gradations from subtle undulations to fast warbles and, in the case of the Filter machine, turning the Mobius into a decent wah-wah. All knobs, parameters and switches are controllable via MIDI, along with patch selection and tempo/LFO sync, although the Mobius will only receive, and not send, MIDI clock.